It would increase EU exports to the US by 8 per cent and US exports to the bloc by 9 per cent. On March 1, 2018 US President Donald Trump announces that he intends to impose tariffs of 25 per cent on steel and 10 per cent on aluminium. The EU responds by drawing up a hitlist of flagship American products it could tax in retaliation including Harley Davidson motorcycles, blue jeans, bourbon whiskey and peanut butter. On March 22, the eve of the application of the measures, Trump suspends them until May 1 for several countries as well as the EU. On April 16 2018 the EU complains to the World Trade Organisation (WTO) over the tariffs. The EU's trade commissioner Cecilia Malmstrom later calls for the bloc to be "permanently and unconditionally excluded from these measures". She says the EU is open to discussions. On April 29 leaders of the EU's three largest economies - Britain, France and Germany - agree to be "ready to react, if necessary, with efficiency and speed" to new tariffs. On May 1 the White House extends the temporary exemption by a month for the EU and also Canada and Mexico. The EU says the decision prolongs trade uncertainties. On May 8 Trump decides to pull the United States out of the 2015 nuclear accord between Iran and world powers, threatening to sanction foreign companies trading with Tehran. On May 18 the EU informs the WTO it is ready to punish American products if the US imposes customs duties on steel and aluminium. On May 23 Washington says it is also planning tariffs on cars, rattling in particular Germany where cars are a keystone industry. On June 1 the US tariffs on steel and aluminium come into effect. Several countries, including the EU, complain to the WTO. On June 22 EU retaliatory measures come into force. Trump threatens 20 per cent customs duties on cars imported from the EU. Several days later US motorcycle maker Harley Davidson says it is relocating part of its production to escape the EU's retaliatory tariffs. US auto giant General Motors warns that it could slash jobs and hike prices due to the tariffs. In November the group announces thousands of job cuts. On July 12 the European Commission downgrades its growth forecasts for the eurozone in 2018, citing trade tensions. On November 21 the WTO accepts to hear complaints from various countries and to rule on the trade dispute over the tariffs on steel and aluminium. On January 18, 2019 the EU unveils plans to forge a trade deal with the US, while not proposing any reduction of tariffs in the sensitive agriculture sector. On the 29 the EU approves the import of American soya to make biofuels, in a bid to bolster the fragile truce. On February 17 a report is submitted to the White House which paves the way for a US surtax on imported cars. A day later Brussels vows a "swift" response. 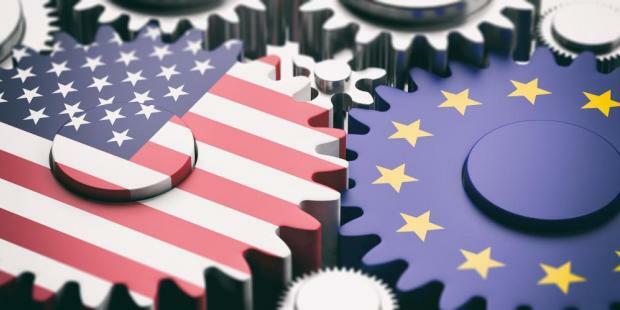 On April 8 Washington threatens to impose tariff counter measures of up to $11.2 billion on a host of European products in response to EU subsidies received by aircraft maker Airbus. Europe says it is ready to riposte. On April 15 the EU approves the opening of trade talks with the United States, despite French opposition, that are limited to industrial goods, with a "red line" on farm products. They should start "as soon as possible," Malmstrom says.